Raider is a 9 mos. old fawn Boxer boy from the Baldwin shelter. 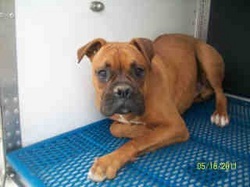 He is being neutered, micro chipped and vaccinated on 06/07/2011. We need to evaluate him for at least 10-14 days before he will be able to go to a permanent home.